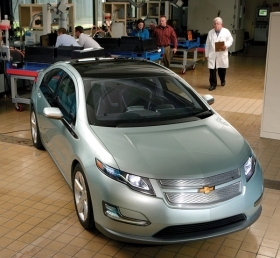 The Chevrolet Volt shown here in the battery lab at General Motors tech center. TOKYO -- Subaru will start making full-sized cars on Wednesday for the first time since production was shut down by last month's Japan earthquake, as the brand steps toward recovery. The move restarts a trickle of some of the best-selling Japanese imports to the United States, the Subaru Forester SUV, Legacy and Impreza. Initial output will be about half the normal rate, as the company gauges parts and power supplies, spokesman Kenta Matsumoto said. Subaru parent Fuji Heavy Industries Ltd. has kept its Gumma vehicle assembly plant closed since the March 11 earthquake battered Japan's manufacturing sector. Production will resume Wednesday with parts still in stock and new parts shipped from suppliers, Matsumoto said. "We don't intend to stop production from here, but if we have to we will," he said. "The situation with every part isn't entirely clear." It had earlier resumed limited production of minicars at the plant on March 31. And the company has been making parts there for overseas factories since March 23. Fuji Heavy is the latest to restart limited production, following partial start ups by Nissan Motor Co., Mazda Motor Corp., Suzuki Motor Corp. and Mitsubishi Motors Corp. But Toyota Motor Corp. and Honda Motor Co. still have the most of their factories off line. In the United States, Fuji Heavy plans to run its Lafayette, Indiana, plant at half production on April 4 and 8 because of shortage of a critical part from Japan and on regular shifts April 5-7. The company expects no U.S. parts shortages there after next week.